Mary Shelley was just 21 years old when her breakthrough novel, FRANKENSTEIN: The Modern Prometheus, was released. Her age was not as much of a story as was the mere fact that a young woman, boldly writing under her own name, produced one of the most important, imitated and admired novels of all time. 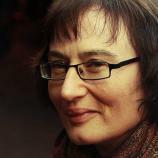 Now, in celebration of the 200th anniversary of FRANKENSTEIN's release, poet Fiona Sampson has put together the most significant biography of Mary Shelley ever written. Her research was tireless, as evidenced by the 50 pages of research notes and reference index found at the back of the book. IN SEARCH OF MARY SHELLEY presents us with a Mary Shelley most never knew and delves into the family, people and tragedies that marked her entire life and provided the impetus for her writing success. Sampson opens things up with the famous and oft-parodied scene from the 1931 film version of FRANKENSTEIN that was directed by James Whale and featured actor Colin Clive screaming “It's alive! Its alive!” over and over at the moment of creation. This put things in perspective with the information to come about the evolution of young Mary Shelley, who came from a tragic household and defied the gender barrier at a time when women had to release their work under male pseudonyms just to get published, let alone onto bookshelves. 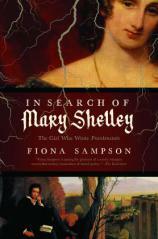 "Perhaps it is due to the fact that Sampson is a published poet that IN SEARCH OF MARY SHELLEY is written in such an engaging and unique style. Never dull, often mesmerizing, this is a biography about an amazing woman and one of the greatest works of fiction ever created." Mary was born in 1797 to semi-famous parents. Her father, William Godwin, was a self-proclaimed atheist and radical philosopher, while her mother, Mary Wollstonecraft, was a fellow radical and writer. They insisted on a home birth with a midwife, no medical sanitization or pain maintenance, and a doctor who literally tore the baby and the successive afterbirth out of the mother with his bare hands. It was most likely this highly unsanitary practice that caused Mary Wollstonecraft to lose her life from puerperal fever --- an unnecessary death that cost the newborn Mary the opportunity to ever know her mother. Even more damaging, she was now to be raised by a newly widowed father who was more concerned with his famous radical friends and was completely ill-prepared for fatherhood. Mary did have the fortune to be surrounded by artists and writers, all of whom inspired her at a young age. She fondly recalled reading her mother's storybook, ORIGINAL STORIES FROM REAL LIFE, that was illustrated by none other than William Blake. She relished priceless opportunities, like having Samuel Taylor Coleridge read THE RIME OF THE ANCIENT MARINER to her in her own living room. She also absorbed lessons from famous fairytales and fables, all of which inspired FRANKENSTEIN, where the creature was not born in any “natural” way. Mary ardently desired the acquisition of knowledge, and at the young age of 16 began penning the outline for what would shortly become her masterwork. Not many knew that she suffered from a lifelong ailment of a serious form of eczema that caused her to regularly keep her right arm shrouded. Her limb made her feel at times like she had a monstrous appendage that no doubt gave birth to the idea of Dr. Frankenstein's creature, who was literally stitched together with body parts that appeared monstrous as well. The days that she spent primarily in Scotland influenced and shaped her in ways she could not measure. Coming from a household with minimal supervision or parental oversight, it was no surprise when Mary ran away to “elope” with one of her father's writer friends --- the poet Percy Bysshe Shelley. The only issue is that Percy was already married. Still, that did not stand in the way of the eventual nuptials, and even a personal letter from Godwin himself, urging Percy to stay with his wife, went unheeded. Just two short years later, Mary seriously began writing her novel and also drew inspiration for the “parentless” creature from a young orphan girl named Marguerite Pascal, who she briefly considered adopting. The name Frankenstein comes from a Rhineland landmark, Burg Frankenstein, one of several castles on the Hessian Bergstrasse. However, the true inspiration for lighting the creative fire inside Mary Shelley came from an infamous weekend at a mystical villa --- a story I had always believed was a work of fiction. The Villa Diodati lay on the shores of Lake Geneva and was being rented at the time by none other than Lord Byron. The stories always claimed that this weekend of supernatural storytelling and other bizarre behavior pushed the four artists to try to outdo each other with their horrific creations. The players involved were, of course, Lord Byron himself, along with Percy, Mary and Dr. John William Polidori, the latter of whom penned the horror classic THE VAMPYRE. Sampson outlines the events of this weekend at great length. For me, it called to mind the bizarre Ken Russell movie from 1988, Gothic. That film, which played out like a bad hallucinogenic-fueled trip, starred Gabriel Byrne as Lord Byron, Julian Sands as Percy, Timothy Spall as Polidori, and the late, great Natasha Richardson as Mary Shelley. I own the DVD and am inspired to watch it again. Sampson's description of the events of that weekend also called to mind the novels of Tom Holland, in which he alleges that Lord Byron was actually a vampire. This is really wild stuff that comes shockingly close to feeling true. Of course, the highlight of the biography is the creation of FRANKENSTEIN, and Sampson provides much intriguing detail about it. Her novel is a statement about the immorality of forcing life on a being whom you have not made well enough to be equal to that burden. The blue sky research methods she employs to put together this work is awe-inspiring and should hit home with any young, aspiring writer. Perhaps it is due to the fact that Sampson is a published poet that IN SEARCH OF MARY SHELLEY is written in such an engaging and unique style. Never dull, often mesmerizing, this is a biography about an amazing woman and one of the greatest works of fiction ever created.